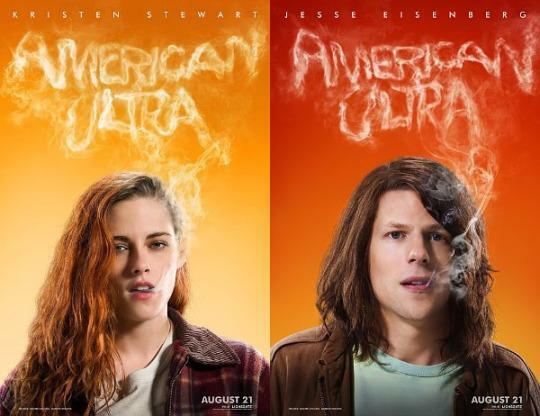 A new trailer is out for next month’s stoner action comedy, American Ultra. In the news trailer we learn that Jesse Eisenberg’s Mike Howell who is a day to day stoner in a small town store, is one of many sleeper agents for the government. However, he doesn’t quite know it yet. After an encounter with Victoria Lasseter played By Connie Briton he is secretly “Activated”. He comes across two men trying to take the wheels off his car and he ends up being able to instinctively kill them both, with a spoon. As the trailer progresses we come to see that Howell is apart of a situation that he never would have expected and his girlfriend Phoebe played by Kristen Stewart gets wound up into it. They enlist the help of Mike’s friend Rose played by John Leguizamo as they try and figure out whats going on while fending off other government agents. Also staring in the movie is Topher Grace who we see for the first time in this trailer, Walton Goggins, Tony Hale and Bill Pullman. Stewart and Eisenberg reunite for this film for the first time since Adventureland in 2009. Nima Nourizadeh directs the picture which will be set to hit theaters August 21st. Scroll down to check out the trailer.